The Jr. Cool Vest is designed with Back-Attaching Belts to prevent unwanted removal. IRONWEAR also makes adult Cool Vest models so that the parent or caregiver can wear a similar looking vest to help the child accept wearing the vest. As an added benefit, when the parent/caregiver wears a vest as well, they can gain a better understanding and appreciation of the effect of the vest and the weights. Wearing the Jr. Cool Vest can be both physically beneficial and potentially fun to wear. The vest is designed specifically for children, breathes well, fits a wide range of body shapes and sizes, and is the safest child's weighted vest available. The Jr. 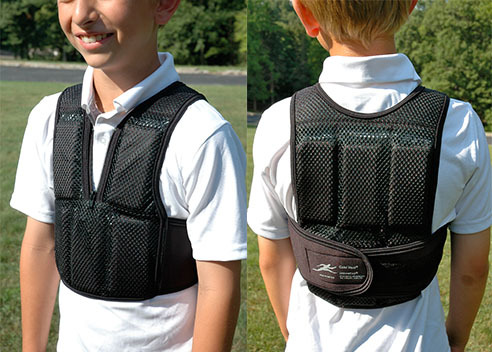 Cool Vest gives the child full range of motion. It can be used for all kinds of activities. Every aspect, from the shoulder straps to the belts and the weights are flexible. The thin tailored design can be worn over or under most clothing. The Jr. Cool Vest is constructed of soft athletic mesh which helps allow air to flow through the vest. This reduces the risk of overheating. Because the vest has the ability to expand, it can fit children as they grow for many years. In addition, the weight can also be increased as needed so that the vest will work for many years on the same child, or the same vest can be used for many different children by adjusting the size and weight as needed. It is ideal for most children between 3 and 11 years old, weighing under approximately 80 lbs. Children's heads are often large compared to their torso, therefore the vest has a zipper opening to allow the head to easily pass through and to keep the shoulders secured in the correct position. The zipper makes the vest more comfortable for the wearer.